Susan Kilgore, 37, of Valley City, North Dakota, and Chris Kilgore, 40, of Iowa City, Iowa, talk at Iowa City's Hamburg Inn No. 2 with IowaWatch reporter Matthew McDermott (right) about whether or not people can have a civil conversation about politics. Photo taken Monday, July 9, 2018. 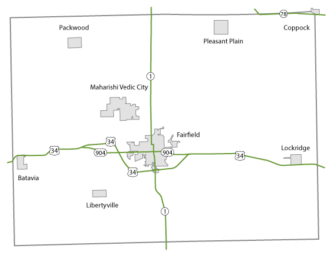 Jefferson County in southeast Iowa is home to Fairfield, a cultural blend of old school Iowan farmers, international students and free thinkers attracted by the lure of Maharishi University of Management, a hub for education and transcendental meditation in Iowa. During the 2016 election, Republican Donald Trump received 46.7 percent of Jefferson County’s votes for U.S. president, while Democrat Hillary Clinton had 46.2 percent, almost a tie. 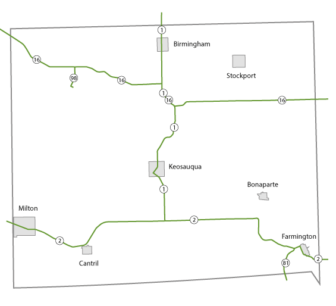 Immediately to the south is Van Buren County, sitting on the Iowa-Missouri border. Its county seat, Keosauqua, is filled with old brick buildings, mansions and reminders of times past. Here, the voting preference is clearly Republican. Trump took 72 percent of the 2016 vote while Clinton collected only 24 percent. 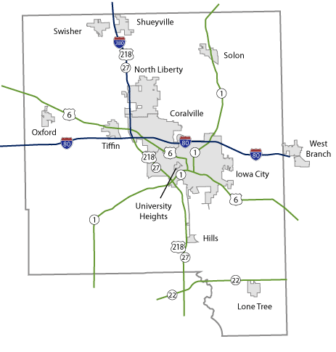 To the north of these counties is Johnson County, home to the bustling Iowa City-Coralville area. Iowa City is a writer’s oasis in the midst of traditional American farming country, and heavily Democratic. Clinton won 66 percent of the 2016 vote and Trump received 28 percent. A series of IowaWatch interviews in these three politically diverse counties in the state that hosts the first-in-the-nation presidential precinct caucuses revealed that polarization remains a powerful force that can halt some Iowans from even wanting to talk about politics. For some, people are too emotionally attached to issues, such as regulating abortion. Others mistrust state and federal political leaders. Several Iowans interviewed said they were fed up with the news media and how politics are reported. And Democrats were predictably upset about Trump. Blaming the other side is an instinct, the interviews revealed. DON’T MISS AN IOWAWATCH STORY. SIGN UP FOR OUR NEWSLETTER AND WE’LL LET YOU KNOW WHEN WE PUBLISH A NEW STORY. 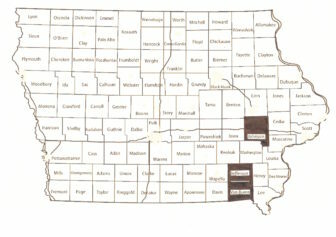 Yet, despite the political disagreement, several voters among more than 50 people IowaWatch spoke with in these counties over several summer weeks said they can talk about politics on a local level. Waugh’s comments reflect a national sentiment revealed in a July 3 PBS News Hour/Marist poll that showed 70 percent of adults questioned in June thought the overall tone and civility in Washington, D.C., had gotten worse since the election of President Trump. The poll of 1,205 adults was conducted June 21-25 and had a margin of error of plus or minus 2.8 percentage points. 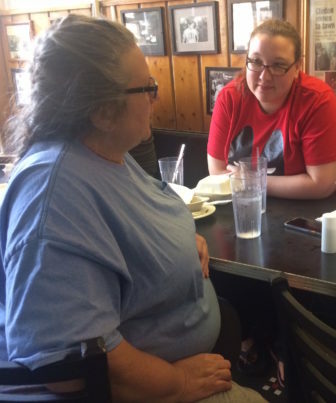 “They are all a bunch of crooks and I don’t mess with it,” a Jefferson County man who declined to be interviewed or give his name said when IowaWatch approached him while he was visiting Keosauqua, in Van Buren County. A lot of people among more than 50 approached by IowaWatch didn’t want to talk about politics. The sun shines momentarily before being replaced by dark storm clouds in downtown Fairfield on a summer day in June. Café Paradiso is quiet in this town of about 10,000 people as customers float in and out before the 3 o’clock coffee rush. 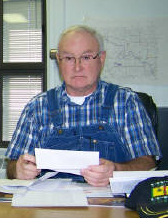 Deininger, a political independent, is a farmer and on-and-off Jefferson County resident for the past eight years. He said he does not see controversy in Jefferson County, despite the vote divide in 2016. For Deininger, the divisions are on a state level, not a local level. Counties scaled by total vote, color-coded by changes in winning party. Richard Reed, a Jefferson County supervisor, said debate is necessary when it comes to the good of the people where they are living. Fellow supervisor Dee Sandquist, also a Republican, said interest in civil political conversation is not a given for everyone in the county. “It depends on who you talk to, everyone is an individual, everyone is different,” she said. Maharishi University of Management student Tamlin Day said he’s felt personally attacked when talking about public policy. Day is a transgender male and an advocate for LGBTQ students. At one point during the summer, IowaWatch tried to pull together a meeting of Jefferson County’s Democratic and Republican party leaders to talk about political discourse. Multiple efforts to talk with Democratic Party Chairwoman Susie Drish were unsuccessful for a variety of reasons, including scheduling conflicts and, in one text, emotional distress over current political events. The county’s Republican Party chairwoman, Marshan Roth, said such a meeting wouldn’t work because it would only divide the county. Iowa’s recently passed fetal heartbeat bill, restricting abortions to being allowed in only the first six weeks of gestation, is one of those issues people have difficulty discussing because it is too controversial, Roth said. “One of my senators put it best, if you stick in Des Moines long enough, you start to think like Des Moines,” he said. In the county seat of Keosauqua, the BP Gas Station has a sit-down eating area where farmers converge over Sprite, coffee, reflection and hushed conversations. 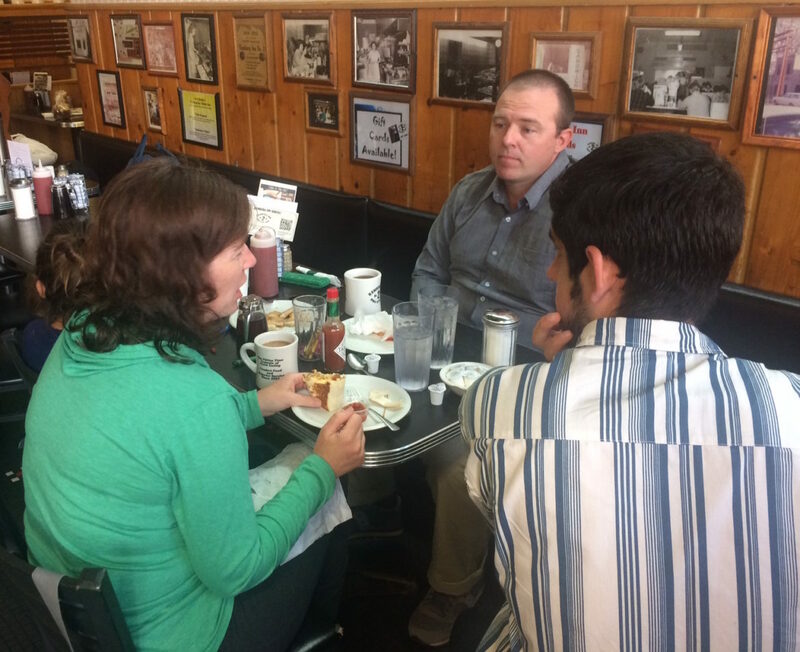 IowaWatch approached three men and asked if people in Van Buren were having a civil conversation about politics. One of the men left immediately. The other two did not want to give their names, although they did a great deal of talking about the 2016 election (they hated Trump less than Clinton), gun control, farming and proper management of local farmland. Van Buren County’s Democratic Party chair Twyla Peacock said she can talk about politics with Republicans unless they are Trump supporters. “He (Trump) is against everything I am for. He has very little respect for anybody,” she said. “At the beginning, when he was tweeting things that were disrespectful, we were talking about that. People thought that he was really going to change things, and we could not agree. I had to walk away. There is no sense in having hard feelings,” Peacock said. Recent polls illustrate the wide disparity that exists nationally when it comes to talking about Trump. A CBS poll showed that 68 percent of Republicans questioned approved of how Trump performed when meeting with Russian President Vladimir Putin in Helsinki, Finland, on July 16. But only 8 percent of Democrats approved, while 29 percent of independents approved. In total, 32 percent of Americans approved and 55 percent disapproved of Trump’s performance, the poll showed. The poll of 1,007 adults was taken July 17-18, with a margin of error of plus or minus 4 percentage points. An ABC-Washington Post poll of 464 adults conducted July 18-20 showed almost the same gap separating how Republicans felt about Trump’s performance and how Democrats and independents felt: 66 approval by Republicans, 8 percent approval by Democrats and 33 percent approval by independents. In total, 33 percent of Americans approved and 50 percent disapproved of Trump’s meeting performance in the ABC-Post poll, which had a margin of error of plus or minus 5.5 percentage points. 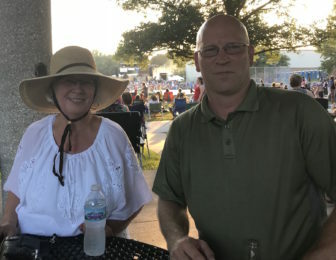 Mindy Allen and Denton Williams at the Coralville 4th Fest the night of July 3, 2018, in Coralville, Iowa. An Independence Day celebration is taking place in Morrison Park, in Coralville, the evening of July 3. The park is packed as rock and roll music is being played on a stage. Families are in their lawn chairs, with picnic baskets and excited children. Stephanie Waddell, 29, of Iowa City, Iowa, and Char Waddell, 61, of Burlington, Iowa speak at Hamburg Inn No. 2 on July 9, about having political discussions with others. Nestled into Iowa City’s north-side business district is the Hamburg Inn No. 2 restaurant, a landmark pit-stop for political figures such as Ronald Reagan, Bill Clinton and Barack Obama, but also a greasy spoon and much-loved establishment for Iowa City townies. Stephanie Waddell and her mother, Char Waddell, sit at the table the morning of July 9 where Bill Clinton once sat in late 2007 when campaigning for his wife, Hillary Clinton, before the 2008 Democratic presidential caucuses in Iowa. Stephanie Waddell, who lives in Iowa City, said people can talk about politics, but to a point. She said she is a military veteran and, while she is a Democrat, she knows many other veterans who are Republicans with whom she can chat amicably about a wide range of issues. But she and her mother said civil discourse ends if it is not in a small group. Char Waddell, who lives in Burlington, Iowa, said she has begun losing hope in the ability of people to come together. At another table, are brother and sister Susan and Chris Kilgore and his grade-school-aged daughter, Ada. Susan lives in Valley City, North Dakota, and Chris lives in Iowa City. Mark Decker, the county’s Republican Party chairman, sees the local vote results. “We are 2 to 1. It is difficult to be a Republican,” he said. Decker said people are having conversations every day, but that compromise is hard. The Republican Party, itself, is divided, he said, adding that he didn’t know how someone can start talking about bringing the party together. “There are a lot of factions. I am unsure if Trump will run again. I don’t think he likes being president very much,” he said. However, Trump has started his 2020 campaign already. Newspaper clippings of political figures’ appearances at the Hamburg Inn No. 2 in Iowa City adorn the small restaurant’s walls. 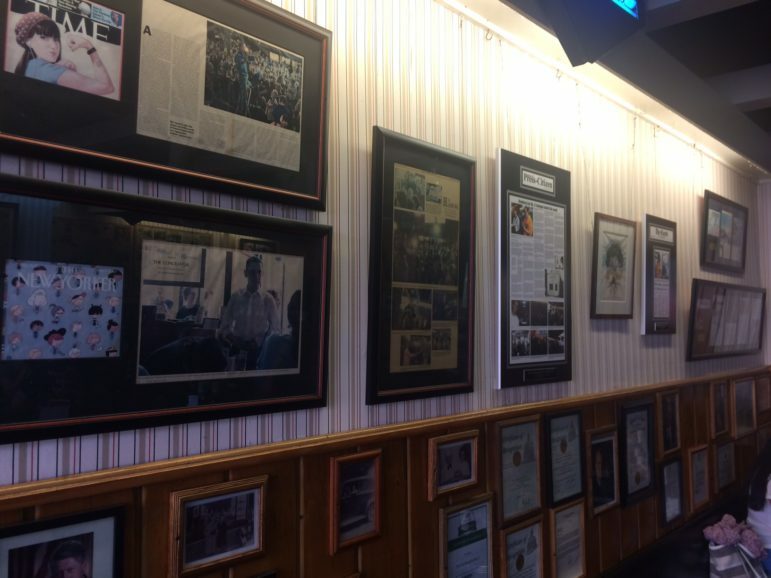 The Hamburg Inn restaurant has been known for attracting politicians during campaigns ever since then former President Ronald Reagan stopped there in 1992 for lunch. Other former presidents who have gone there are Bill Clinton and, while campaigning for his first presidential term, Barack Obama. Photo taken July 9, 2018. One topic that is generating considerable debate in Iowa is a fetal heartbeat bill signed by Gov. Kim Reynolds, a Republican, on May 4. The bill was scheduled to become state law July 1, but a lawsuit from Iowa’s Planned Parenthood and the ACLU-Iowa has been filed in order to halt the bill. The fetal heartbeat bill is designed to prevent abortions from being conducted six weeks after conception when the heart of the fetus can be heard. Laura McGraw, president of the Iowa Abortion Access Fund, said abortion opponents and supporters need to be talking more consistently about their differences. However, she said, “abortions will always happen. It will always happen, always has, always will,” she said. Historically, talking about abortion takes activists to a place where no room for compromise exists. “Stopping abortion is the ultimate goal,” DeWitte said. Hans Hassell, a former political science professor at Cornell College, said Americans do not always have to agree. He points to the theory called deliberative democracy as the way people in America talk about politics. Deliberative democracy refers to how a series of discussions are held, focusing on a certain political topic in order to determine what the majority wants. Debate and bargaining may occur in those discussions. In other words, disagreement is not bad. “You can have a reasonable discussion and debate, but consensus cannot always be reached,” Hassell said. This IowaWatch story was republished by The Fairfield Ledger, The Des Moines Register, The Hawk Eye (Burlington, IA), The Gazette (Cedar Rapids, IA), Dyersville Commercial, Cascade Pioneer, Manchester (IA) Press and InDepthNH.org under IowaWatch’s mission of sharing stories with media partners. A new Iowa City voter who recently passed a test to become a U.S. citizen but had not yet participated in a swearing-in ceremony almost lost a chance to vote Tuesday. But County Auditor Travis Weipert tracked the voter down so that the voter could return to the polling place and cast a ballot.